Phipps has something for everyone this holiday season. Take your mouse for a ride, and while you're here, enjoy the view! Dreaming of a White Christmas? Look no further. Chocolate or vanilla cake covered in pretty white snowflakes. Your choice. A blanket of eggnog mousse tops our creamy dreamy cheesecake. Layers of vanilla cake and chocolate cake layered with buttercream & fudge frosting, and decorated to look like a birch tree. Christmas lights (aka candy confetti) and other bling adorn strings of chocolate ganache on our chocolate and vanilla cakes. Moist ginger cake baked with just the right amount of spice and wrapped in creamy white cream cheese frosting. Light chocolate cake wrapped and layered with our rich cream cheese frosting. Decorated with a red Christmas rose. These cakes will light up anyone's eyes. Your choice of either chocolate or vanilla cake topped with gold coins and gold bling. This is a winner any time of year. Dress it up with a dollop of ice cream. Currants, raisins, apples, spices and orange zest gently simmered together. Baked into a pie; it's rich, sweet and heavenly to eat. Serve with whipped cream. 26.99-8" 49.99-10"
Moist carrot cake laden with oranges, Christmas spices and raisins. All iced in cream cheese frosting. These should be on everyone's Holiday wish list. Tender, sweet buttery shortbread. Also available with milk chocolate chunks. Packed in 6's or by the dozen. Twice baked cookies perfect for dipping. Orange Almond, Chocolate Hazelnut, Double Chocolate and -Cinnamon Walnut. The traditional gingerbread cookie decorated with royal icing. Crunchy with just the right amount of spice. Meringue rosettes decorated in gold and silver. Also available as individual nests. Did you know that Macaroons are made without flour?Available in perfectly plain, and bittersweet chocolate. Packed in bags of 6. Popped corn, and toasted nuts tossed in buttery caramel and white chocolate. Soft, chewy and perfectly spiced. Packed in bags of 6. Crunchy caramel, toasted almonds and milk chocolate. Packed 12 oz. or 16 oz. Scroll down for Sweet Tray pictures and pricing. Pumpkin Pie topped with cinnamon and spiced pumpkin seeds. Looks crunchy, sweet and gorgeous with the addition of the seeds. Spiced up pumpkin cake iced in cream cheese frosting and topped with cinnamon spiced pumpkin seeds. Pumpkin and maple! Two fall flavours that marry well. Pumpkin cheesecake topped with maple-spiced whipped cream. Traditional double crusted apple pie. Deliciously good heated slightly and served with ice cream. Break from tradition. This tart and sweet combination will be worth it. Available in 8" and 10" size. Caramel or Chocolate. Tough decision but neither one will disappoint. Our creamy apple cheesecake topped with our homemade caramel. The perfect balance of spice and pumpkin baked up in this moist recipe for pumpkin cake and baked up in a bundt pan. One size. A butter cake baked with cinnamon-spiced and brown sugared apples. How Divine! Perfect for any occasion. Wrapped in cello so it makes a nice, sweet giftie too. Gluten free. Just add whipped cream, fresh berries, lemon curd, chocolate sauce or whatever you fancy. Orange Almond/Chocolate Hazelnut/Double Chocolate Cranberry. Delizioso! Rich, Chewy gluten free cookies. Chocolate, Caramel, Pecan, or Cranberry Pecan. Let us all give thanks for this Canadian tradition. Seeds so good and good for you. Perfectly spiced, soft and chewy ginger delights. Chocolate Chip, Double Chocolate or Perfectly Plain. 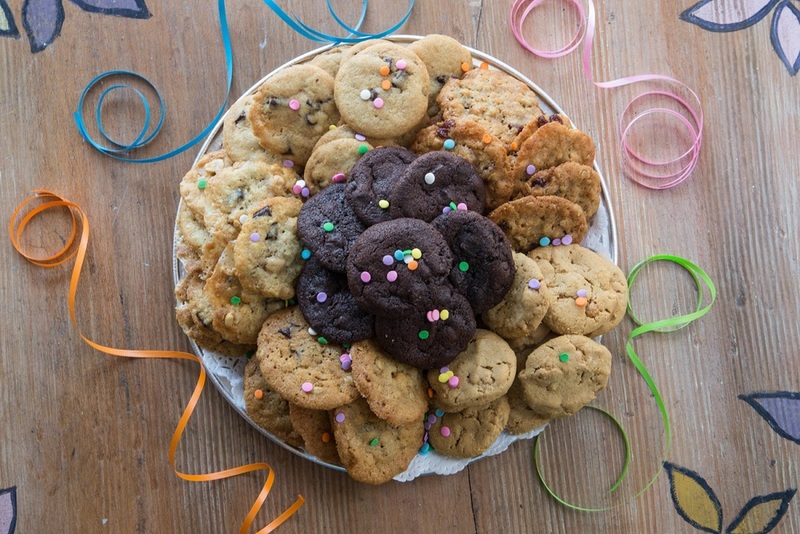 Visit our Cookie & Sweet Tray page. Bite size squares, tarts and cookies, beautifully arranged on a lovely keeper basket (not pictured here) and ready for your guests to devour. 10" tray (25-36 pieces, serves 10-12), 12" tray (60-65 pieces, serves 18-22), 16" tray (100-110 pieces, serves 30-36). Please note: Any additional items added to the trays will be priced separately.